Hi everyone. 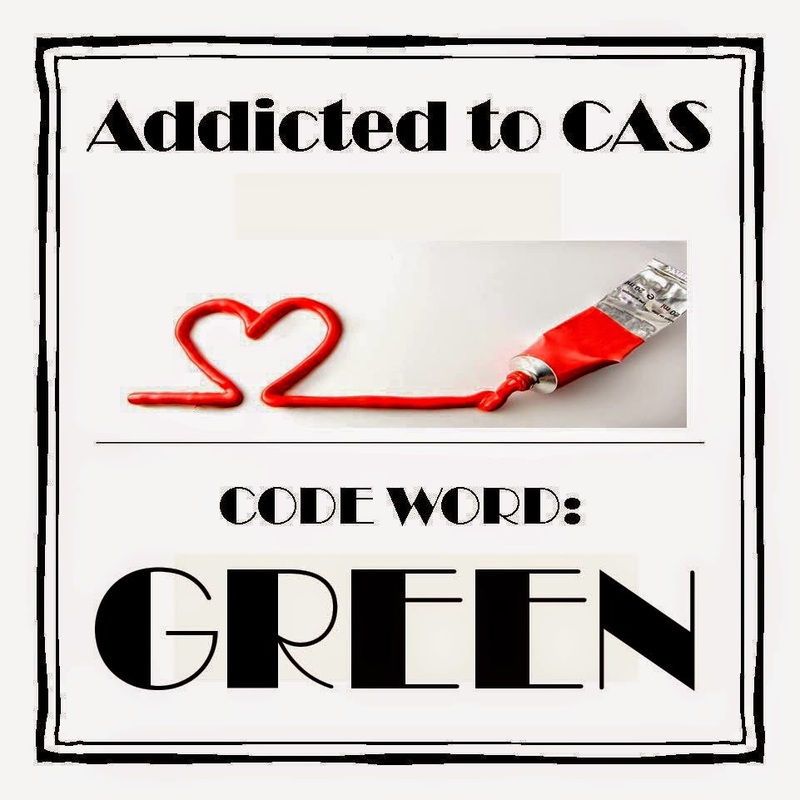 Today is the start of the new challenge at Addicted to CAS. This time, the challenge is hosted by the very talented Vicki (All I Do Is Stamp). I used free digital images available from Scribbles Designs (click on link above), to create this fun card. I fussy-cut the pieces and paper layered (paper pieced) the owl, sponging around the outside edges of all the pieces to add shading and depth. Then I glued it together, added clear wink of stella to the beak and eyes before coating them in glossy accents. So fun! The leaves with fussy-cut, sponged for shading, and shaped with my stylus and mat before mounting them to a die-cut branch. This month we are so thrilled to have Birgit (Rapport fran ett skrivbord) joining us as Guest Designer. Please click HERE to see Birgit's amazing "green" card, along with the cards from the rest of our talented Design Team. I'm entering this card into Simon Says Wednesday Challenge - Things that fly. This is one fabulously fun card Loll. Love this owl and love that sentiment. How adorable, Loll! Love the glossy eyes! Fun and fabulous! How cute is that owl! Lovely rich greens and cute, cute owl! Great card Loll, I checked them all out but love yours the best! I looove your card Loll! That image is adorable and colored perfectly! Awesome fussy cutting - I thought they were die-cuts at first! What a fun card, Loll, and perfect for our "Things That Fly" challenge this week! Love the shading on all of the elements! Thanks for joining us at the Simon Says Stamp Wednesday challenge! Such a fun card, Loll! I love the owl and how you added texture and dimension with your inking...so cute! oh my goodness - that face is priceless! I love how yow you made a digital image in to such a gorgeous card! Love that owl sitting so proud on his branch! great colors and design Loll! Thanks for introducing us to Scribble Designs. She has lots of fun stuff!! Your card is a great use of her images! I adore this card, love your creation, so fun and gorgeous, just love it lol! This card is alive! It's like a cut piece of reality. Lovely idea, exceptional attention to detail. I love this card. Love that little hooter, Loll! Simply adorable! Oh, that's sweet image! Adorable card! What an awesome card! Where did the greeting come from? Eek! I love this card! I love your little owl and leaves. All of that fussy cutting and sponging was definitely worth the effort! I love owls of any kind and this one is so perfect, Loll. I love the coloring, and his branch and the sentiment. I'm just in love. Love this fun 'down in the mouth' little owl and a great layout too Loll. 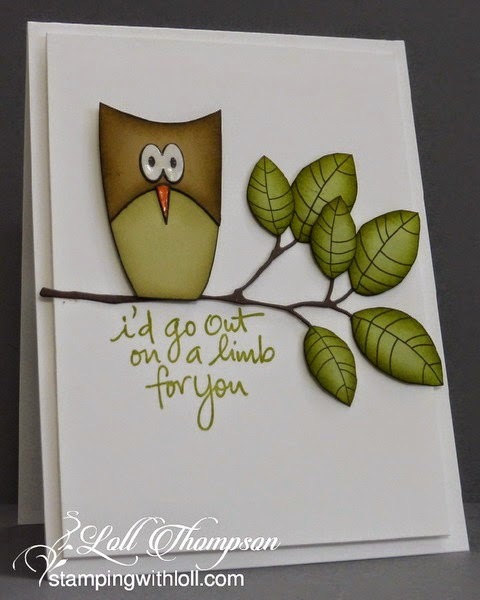 Loll, I love your owl and what a great sentiment to go with your beautiful card. I hope you are feeling better!